Common house mice are demolishing what could be the only breeding population of endangered Atlantic petrels in the world, scientists have found. Of the 1.6 million chicks that hatch every year on UK-owned Gough Island in the south Atlantic, scientists estimate that a massive 1.25 million are eaten by mice. What's more, the researchers say Atlantic petrels probably aren't the only seabirds on Gough Island targeted by the mice. "We know they're eating petrel chicks and albatross chicks on Gough. But other researchers have shown that on other islands, mice prey on much smaller petrels like the blue petrel, ashy storm-petrel and white-faced storm petrel," says Dr. Ross Wanless from the University of Cape Town, lead author of the study. "This suggests they're also a threat to other, smaller seabirds on Gough Island." Wanless and his colleagues are now calling for complete eradication of the rodents from the island to halt the birds' further decline. "The problem is it would cost about £5 million to eradicate them completely, which isn't exactly small change. We can't afford for any eradication programme not to work. But everyone acknowledges that getting rid of these mice is a top priority in the world for seabird conservation," he says. "Using current technologies, dropping poison pellets from helicopters, nothing would stop a successful eradication. You'd need a big box of bait, helicopters, a storage ship for the pellets and people," he adds. 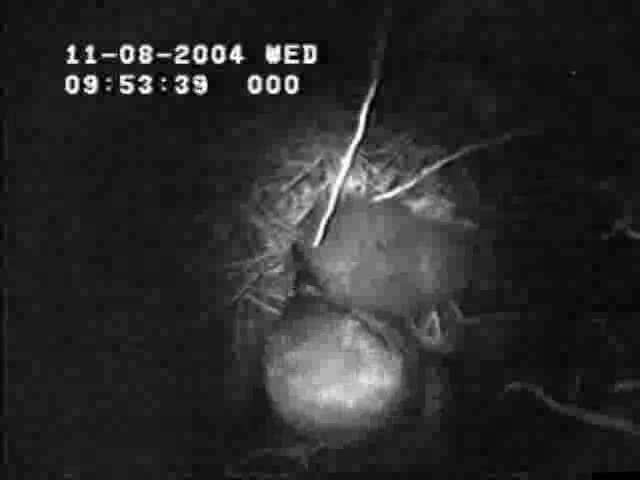 Time-lapse, infra-red footage of mice attacking a chick in its burrow. It's pitch-dark in the burrow, so the parent has no idea what's going on, but senses trouble and tries to protect its chick in the only way it knows - to stand over it. But the mice eventually kill the chick. Gough Island is both a nature reserve and a UNESCO World Heritage Site and has one of the most varied range of seabird colonies in the world, including six endangered species. It's thought to be the only place in the world where Atlantic petrels breed, with nearly two million breeding pairs. Until recently, there was a breeding population on Tristan da Cunha - another island in the south Atlantic. But scientists now think this population has been destroyed by invasive black rats. Indeed, scientists have repeatedly found that accidentally-introduced mammals, like cats, rats and pigs have caused the majority of island-based bird extinctions. Until recently, conservationists focussed on getting rid of these creatures from islands. But when scientists noticed the poor breeding success of seabirds at Gough Island, they began to wonder if invasive mice were causing the problems. House mice were accidentally introduced to the island more than a century ago via seal-hunters' ships. "Everyone assumed mice wouldn't have rat-like impacts," says Wanless. "Just 25 years ago, house mice were deemed to pose no serious threat to seabirds." But the Atlantic petrel is particularly vulnerable to mice, because it nests entirely on the ground, making burrows in which it lays its eggs in the winter. The Atlantic petrel is classed as endangered on the IUCN Red List, because its small breeding range puts it at risk from natural disasters and predators. To get an idea of the scale of the problem on Gough Island, Wanless and a team of researchers from NERC's British Antarctic Survey, SANAP and the Royal Society for the Protection of Birds tracked the fate of 178 Atlantic petrel nests over four seasons. They inspected the nests every week and set up three infra-red cameras at nests to record the rodents' movements. They found mice in all the burrows they monitored. They also recorded mouse attacks on six Atlantic petrel chicks and on one great shearwater chick. In one breeding season, they discovered that just one Atlantic petrel chick fledged from 58 nests they monitored. "On islands around the planet, mice have been overlooked to the extent that they've been left behind and could become a significant problem. But the dominant paradigm until now was that mice just don't do this," Wanless says. "Every effort should be made to protect Gough Island and the rich biodiversity it hosts. 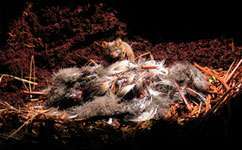 All island restoration and management plans should routinely include eradication of introduced mice." The study is published in Animal Conservation.